“Often, there is the tacit assumption that to criticize Sathya Sai Baba is itself a slight against India. This is offensive to a great many Indians from all walks of life who do not think that Sai Baba is a reflection of all that is good in their country. Yet this is the India that Sai Baba has said he will transform. He has spoken of first “cleaning up his own backyard”, before saving the entire world before he dies. He is now very old and sick”. 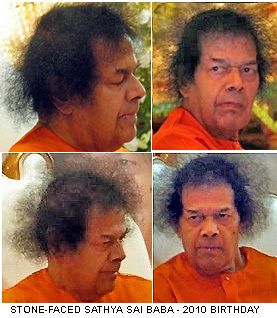 “Sathya Sai Baba’s many reported weeping episodes have taken – as from circa the year 2000 – a marked upsweep after the advent of worldwide exposure of widespread serial sexual abuse of boys and young men (See also HERE and HERE); his implication in the massive local, state and central governments’ cover up of police killings in his bedroom at Puttaparthi (See HERE and HERE and HERE); vast misappropriation of billions in funds collected worldwide (See HERE and HERE and HERE); his vast opulence in a land of great poverty, squalor, ignorance and superstition; his failed predictions (See HERE and HERE); and much else that reveals him to be one of history’s great imposters, whatever may be the good deeds that he has sparked off in many of his devotees”. 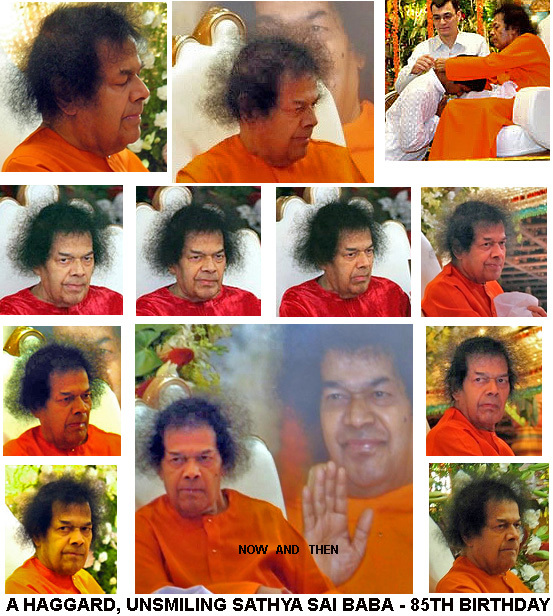 “At his 60th birthday, Sathya Sai Baba foretold that he would not physically age. But now look! And compare the various older photos with those only of the last days. While the authorities are making temporary arrangements for the visit of notable persons from 150 nations, problems of long-pending basic amenities haunt the dwellers. Almost all internal roads are ruined and drains are waterlogged across the town …. Sewage treatment is in shambles though civic authorities renovated it with Rs 1 crore last year. Residents are concerned as unhygienic conditions prevail at the municipal compost yard. The government assured that it would provide boating facilities for devotees in Enumulapalli tank, but this has not materialised yet. Dwellers urge the government to take up roads and drainage system restoration works before Baba’s birthday, else it would give a bad impression to the visiting dignitaries. The person who wrote to me the following apparently comes from Andhra Pradesh, the State in South India where Sathya Sai Baba has his chief ashram in Puttaparthi. They commented on my previous blog: Wikileaks and Indian Troops Atrocities Reports. Sai Baba Fails To ‘Clean Up Own Backyard’. In regard to Sathya Sai Baba-related corruption, the person speaks of my “inferring by some convoluted logic that it parallels the causes for India’s many sicknesses”. It strikes me that the writer uses the notion of corruption “parallels” in a systemically misleading way. Surely a more helpful contextualization of the corruption issue to be seen in Sathya Sai Baba and his core servitors in comparison to widespread, endemic corruption in India is a notion not of ‘parallel’ but of symptom. This is to say that – apart from the fact that corruption can be found in any social system – many of the Sai Baba-related corruptions reflect aspects deep-rooted in the Indian social system, and promoted by its flaws. It would, of course, be absurd to say that all the corruptions to be seen in one part of a social fabric are replicated in every other instance. For example there are Sathya Sai Organization programs which serve human beings without discrimination on the grounds of caste or creed. A discussion would need to be complex, and attempt some weighting of relevance among phenomena often encountered in India as guru worship, demagoguery, casteism, nepotism, and elitism of various kinds, superstition and dependence in matters such as astrology (not least among the elites), vast social inequality, dowry, and so on …. “Wikileaks reports of Indian troops atrocities and judicial barbarism by Indian authorities points to but one of a number of huge issues erupting in India right at the moment. Every tragic year that passes shows that Sathya Sai Baba has not “cleaned up (his) own backyard”, as he long ago promised he would do. India’s security and well-being do not rest in the hands of her superstitious and corrupt leadership – many individuals of which gather around Sathya Sai Baba. They are in the hands of those who, at every level, actively and honestly struggle, with great sacrifice, against the systemic venalities”. “For their own karma, all Gurus deserve a healthy dose of irreverence! However,’guru-bashers’ need to be wary of mixing-up issues. This is particularly true when indulged in by foreigners. Ex-devotees of Sathya Sai Baba may have legitimate complaints about him, but ‘inferring’ by some convoluted logic that it parallels the causes for India’s many sicknesses, is silly and counter-productive. Today, all Indians, whether devotee or non-devotee, atheist theist and agnostic alike, are hugely shamed by the unending exposure of monumental scams in the country. 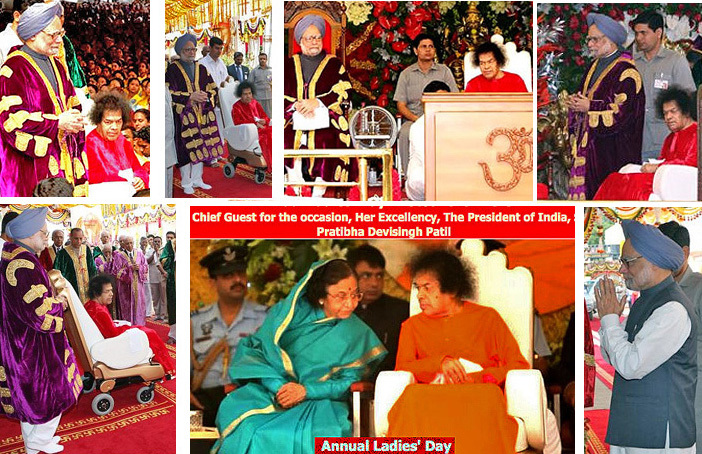 By imputing Sathya Sai Baba for India’s ills, is trivializing and misconstruing the scale and its causes. Devotees will exploit the opportunity to elevate the aging Baba to someone like Christ being crucified for the sins of others”. 1. That there are courageous forces in India – and always have been – which oppose the corruption. 2. That, among a plethora of other mischiefs, Sathya Sai Baba is exposed by his failure to do what he has long proclaimed that he will do – namely, raise India to great moral and spiritual heights and then the world – effectively, within his own lifetime. 3. The term “guru bashers” is a term that needs, case by case in situations of usage, to be analysed. It is often too much of a label and a curse word, which can obscure the real intents and the arguments being advanced. 4. It is correct that devotees can exploit adverse criticism. Or rather, to be exact, some devotees, because many of them avoid controversy of any sort and simply get on with their prayers, bhajans, etc. But when have not some of those blinded by cultic belief NOT attempted to exploit adverse criticism? Yet, silence or watered down critiques are not likely to be helpful, are they? 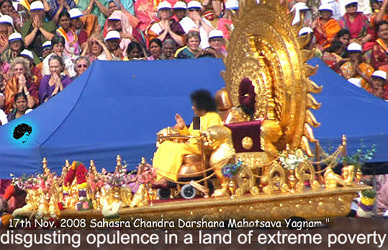 What critics of Sathya Sai Baba and his cult have attempted to do is to expose the huge deficit between precept and example – the monumental cover ups, the sexual and other abuses, the repeated failures of predictions and of promises (such as of healing, placement in his educational and other wings …), large-scale scams in regard to provision of water, of apartments, the lack of duty of care within the worldwide Sathya Sai Organization, the vast wastage of internationally-contributed funds in glorifying Sai Baba via luxurious buildings, golden trappings of imperial splendour, lack of accountability and transparency by the Sathya Sai Central Trust, Sai Baba’s countless contradictions that are to be found in his officially published discourses and other such sources; and much else. Wikileaks reports of Indian troops atrocities and judicial barbarism by Indian authorities points to but one of a number of huge issues erupting in India right at the moment. Every tragic year that passes shows that Sathya Sai Baba has not “cleaned up (his) own backyard”, as he long ago promised he would do. India’s security and well-being do not rest in the hands of her superstitious and corrupt leadership – many individuals of which gather around Sathya Sai Baba. They are in the hands of those who, at every level, actively and honestly struggle, with great sacrifice, against the systemic venalities. US diplomats were given evidence suggesting India was systematically torturing civilians in Kashmir, according to leaked cables. “Belief in such primitive superstitions as “black magic” is promoted and encouraged by Sathya Sai Baba (see here documentation from his books authorised by him and sold in his bookshop) . Many are the demonstrably mistaken accusations thrown at those who have stood forth to expose Sathya Sai Baba and his international sect. For example, typically taking our remarks badly out-of-context, it is said that we are: “India bashers”. But these defenders of Sathya Sai Baba and his cult do their cause harm; and we learn that many Sai devotees will have nothing to do with them – although we also know that some who are close to Sathya Sai Baba have assisted them in various ways. The absurdity and intellectual dishonesty of their attempts to defame will not win them the favour of astute and questioning readers. 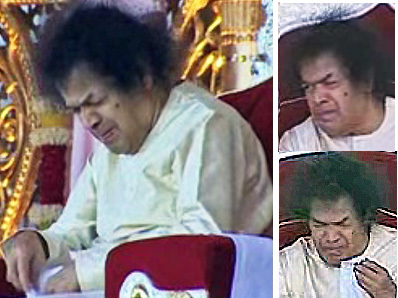 Confirming many reports of Sathya Sai Baba breaking down and weeping in more recent times, there is now brilliantly clear and revealing video footage for all to see. So great is the grip of elites who hold wealth and power in India that many Indians, both those who live inside and outside India welcome – though with feelings of deep shame and desperate hope for deliverance from the evils – well-informed information that emanates from outside India. The article (see below) by a member of School of Regulation, Justice and Diplomacy, College of Asia and the Pacific, Australian National University, Canberra, may serve as but one example of writing that points to the ubiquity of graft scandals in India, while pointing to some of the attempts courageous and determined Indians are making to oppose this. THE wealthy in India are laundering $19bn a year. ALTHOUGH corruption in India is nothing new, recent examples appear to put the country in the category of one of the worst kleptocracies, and a survey indicates widespread disillusionment with the Singh government. Former mines minister and chief minister of Jharkhand, Madhu Koda, is in jail on charges of having siphoned off $US1 billion ($1bn), mainly from corrupt mining deals, during his short tenure. By laundering funds through cronies, Koda managed to acquire hotels around the world and even a mine in Africa. Although India has passed legislation to strengthen its anti-money-laundering regime, a recent Global Financial Integrity report found rich Indians launder a staggering $US19bn a year. According to a government audit, the 2G telecommunications licence sales of 2008 cost the Indian state $US39 billion in lost fees due to under-selling to favoured magnates. Indian journalists, who are usually associated with the vigorous exposure of corruption, were caught up in an unholy alliance of influence between the telecommunications companies and government officials involved. And to India’s international shame, the administration of the New Delhi Commonwealth Games was replete with examples of corruption and incompetence. All payments for Games services are now frozen pending the corruption investigations. Legitimate providers, including some leading Australian companies, are incurring millions of dollars in losses, leaving India’s reputation in tatters and putting at risk the staging of future events. Tax evasion is widespread, and accused evader Hasan Ali Khan (supposedly an associate of mobster Dawood Ibrahim) allegedly illicitly put $US8 billion in the UBS AB Zurich bank. In another major claim of money-laundering and cover-up, the Indian government is trying to suppress documents linked to the accounts of Indians in the Liechtenstein LGT Bank, the bank infiltrated by a German agent. Audits of the Mahatma Gandhi National Rural Employment Guarantee scheme, the giant rural work program intended to uplift the poor, show that in some states only a small percentage of the allocated funds reaches the intended recipients. Even the military, hitherto relatively free of corruption, has recently been involved in several land scams, including the notorious Adarsh scam in Mumbai, in which apartments intended for military veterans were instead allocated to high-ranking officials. Smaller in scale, but if anything more excruciating for cricket-mad Indians, is the Indian Premier League scam, which claimed the scalps of several luminaries of the Congress party. These and many other cases illustrate the rapid decline in the state of governance in India. This in turn casts a shadow over future development and stability in the emerging Asian giant. But is this an accurate depiction of the state of affairs in India, or are there other, perhaps more hopeful, interpretations? The emerging role of governance mechanisms such as the “social audit” by India’s vigorous civil society sector, activism in the financial and tax departments, judicial activism – particularly in the Supreme Court – and investigations by India’s media are discovering cases of corruption and seeking to impose justice. The exposure of such cases appears to indicate a system out of control. However, you could argue that unlike true kleptocracies, at least corruption in India is frequently being exposed and the perpetrators brought to justice. And the enhanced role of government agents in audits, tax and financial regulation can fill some of the gaps left by India’s somewhat etiolated anti-corruption mechanisms. For example, the audit process built into the Mahatma Gandhi scheme has proved quite effective in uncovering impropriety and improving performance. Such government processes are augmented by the activities of non-government organisations, which are conducting social audits. In an Indian first, Andhra Pradesh state has decided to turbocharge the social audit process by giving it state support and legal sanction. In the 2G sale scam, it was the government’s audit office, the office of the Comptroller and Auditor-General, that identified the shortfall of about $US39bn. The Telecommunications Minister has been forced to resign, and other heads are likely to roll. The Supreme Court (equivalent to Australia’s High Court) has been active in seeking to expose the corruption. The court recently ordered the government to lift the suppression of information relating to German correspondence with the government about Indians with accounts in Liechtenstein. It has played a leading role in unseating the recently installed head of India’s federal corruption watchdog, the Central Vigilance Committee. In a case eerily reminiscent of the way Al Capone was brought to justice, the Enforcement Department of the Ministry of Finance initiated the actions against Koda, precipitating the wider involvement of other anti-corruption and law-enforcement agencies and bringing about his eventual arrest. So at one level you can lament the apparent decline of public life in India and the breathtaking scale of corruption. But at another, you can note that many illicit activities are now being exposed and that the checks and balances built into India’s democracy still appear to be functioning. In other words, you can either adopt a glass half-full or a glass half-empty view of corruption in India. My guess is it that it was always there, but now appears to have increased because it is more frequently exposed. An array of media, scholars, government services, civic institutions, and many others read our writings. I have extracted the following links related to police and security from a Links page with brief commentaries on articles. That page has been assiduously compiled by Robert Priddy, and contains links to many articles he and I, and any other extensive writer such as Brian Steel, have written on an array of topics concerning Sathya Sai Baba and his cult. Note: Please kindly report any errors, updates, or suggest improvements. 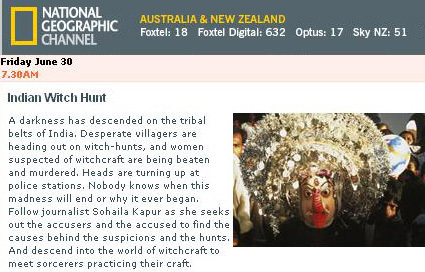 These overviews are very far from exhaustive … See contact details under: Barry Pittard, at bottom of right hand sidebar. The Puttaparti Police expansion and Sai Baba – cont. How the publicly-financed security at Sai Baba ashrams was introduced etc. The ‘Abode of Peace’ ashram- the murder victims Some details of two of those murdered in cold bloog in Sai Baba’s bedroom in 1993. ON VISITING THE SAI BABA ASHRAMS Many difficulties, disappointments and potential dangers – up to and including murder – face those who visit Sathya Sai Baba ashrams. Tight security is used against visitors to protect the fearful Guru-God and discrimination of non-ethnic Indian followers, especially Westerners, has become rife. Judging by countries I know well, the current list of over 200 names of former members or active followers registered represents only perhaps 5% of those who have left Sathya Sai baba’s organization and movement, as most do not wish to speak out and be demonized – many wish to continue to visit India in safety. Failings in Indian Justice – by ex-Chief Election Commissioner T.N. Seshan The Indian judicial system as originally inherited from the British stagnated, but is slowly caching up with the developed world – but only on paper, it appears. Abuses and failing are so huge and so many, as any follower of Indian events knows, that police and protected person can and do ‘get away with murder’. 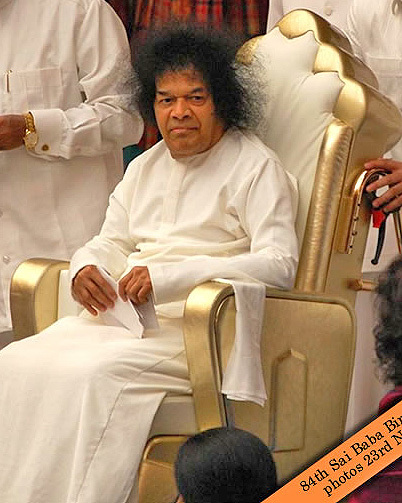 Sathya Sai Baba – questions and his silence In a discourse after the six 1993 killings and executions, Sathya Sai Baba attacked the Anantapur media hotly saying that it contained “nothing but flights of the imagination”. He never answered any questions on his part in the incident and was held above the law by the Indian government. “Let anyone say anything; remain calm”. “Sai is unaffected by praise and blame”. Sathya Sai Speaks Vol. 14. “When I am defamed, I never get incensed, for it is only the tree full of edible fruits that is attached by sticks and stones.” Sathya Sai Speaks Vol. 4 p. 184. In recent years, there has been a marked increase of reports that depict Sai Baba acting in many ways not previously typical of him. However, there is now 85th birthday celebrations video footage of him breaking down and crying. Or, to be exact – as the viewer can, with the greatest clarity see – breaking into uncontrollable sobbing. “Rama and Krishna were ever youthful. Have you ever seen a picture of Rama or Krishna with grey hair?….. Usually old people have wrinkles on their faces … I do not have any signs of old age. (loud applause). There is not a single wrinkle on My face”. Sanathana Sarathi, October, 2002. MAJOR WORLD CATASTROPHE PREDICTIONS ATTRIBUTED TO SATHYA SAI BABA. Ageing and collapse in Sai Baba’s health. 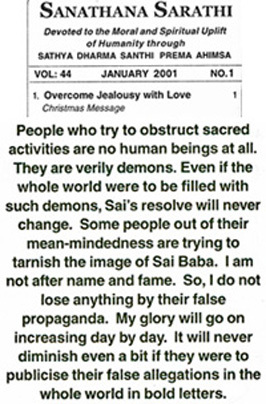 Sai Baba Exposé Hidden facts about Sai Baba and his Worldwide Cult. Some former devotees of Sathya Sai Baba get upset that many survivors of his sexual and other forms of abuse do not go public. They make the same kind of mistaken assumptions that Sai Baba’s defenders make who ask e.g., where is all the proof? Both these reactions are ill-informed, inappropriate and insensitive. Uncertainty about the exact order or nature of events – e.g., this lays an honest individual open to charges of fabricating, and many abuse victims who have faced adversarial lawyers have spoken about the experience of being ‘raped twice over’. See below, a list excerpted from: Post-Cult Problems: An Exit Counselor’s Perspective, by Carol Giambalvo. “In 2000 I resigned as National Contact person of the Sathya Sai Organization in Norway after 18 years fulfilling that role. This was no easy decision, since I did not believe that the allegations of sexual abuse could be true, even though I knew that Sathya Sai Baba was deeply involved in the massive cover-up of murders in his own bedroom, and hence an accomplice to the fact. Having refused to read David Bailey’s account or any of the flood of allegations thereafter for months, I finally felt I must read the sexual allegation testimony. It took me about another six months of intensive investigation – contacting all the sources I could – before I was forced to arrive at a complete conviction that most of the allegations were both true and accurate. Subsequently I began to look carefully into all aspects of Sathya Sai Baba from the viewpoint of critical questioning and found, to my dismay, deceit after deceit and evidence of a major campaign of deception by him and all those close around him. This resulted in many web pages, which the award-winning rationalist, Basava Premanand, asked permission to publish”. See also, Priddy on his earlier pro-Sathya Sai Baba book ‘Source of The Dream – My Way to Sathya Sai Baba’ (New revised ed. 1997 Samuel Weiser, Inc. P.O. Box 612. York Beach, ME 03910-0612. U.S.A. ISBN 1-57863-028-2), and the transition to his critical work. Some survivors of sexual and other abuses by Sathya Sai Baba and some of his close servitors have, despite the great upheaval in their lives, joined our representations to governments, media and many civic institutions. Those who have dared to speak of their experiences on the Internet have been attacked in the extreme by some pro Sai Baba activists. Many young males from countries around the world have come to our network with compelling accounts of being sexually abused by Sathya Sai Baba. Some much older men like Mark Roche who shared his ordeals – when very young – in the BBC’s ‘The Secret Swami’ when much older) also speak to us of being seduced by Sai Baba, sometimes when they were in their teens, at others, when still very young men. Repeatedly, we find that survivors have not availed themselves of highly qualified professional counseling – even when it has been offered to them free of any charge. In short, not debriefing, with proper professional counseling, their experience puts at grave risk an abuse survivor’s chances of health and well-being. Carol Giambalvo is an ex-cult member who has been a Thought Reform Consultant since 1984 and a cofounder of reFOCUS, a national support network for former cult members. She is on ICSA’s Board of Directors, Director of ICSA’s Recovery Programs, and is responsible for its Project Outreach. Author of Exit Counseling: A Family Intervention, co-editor of The Boston Movement: Critical Perspectives on the International Churches of Christ, and co-author of “Ethical Standards for Thought Reform Consultants,” Ms. Giambalvo has written and lectured extensively on cult-related topics. In 2008 Ms. Giambalvo received ICSA’s Margaret T. Singer Award.